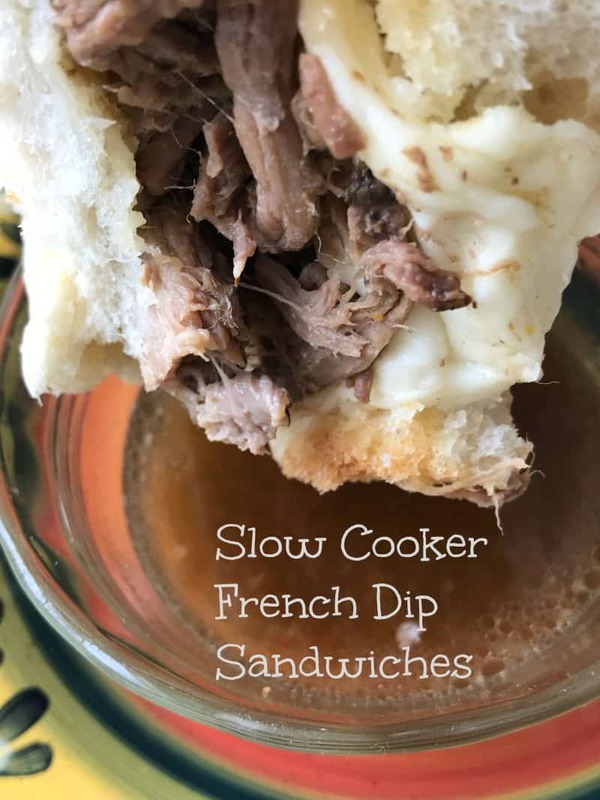 Slow Cooker Easy French Dip Sandwiches are fast, easy, affordable and delicious. Throw all the ingredients in your slow cooker, turn the cooker to low, and head out the door. When you get home after a hard days work or play, supper will be waiting for you! Serve on buttered, lightly toasted baguette, top with a slice of provolone cheese and French fried onions. Wrap in foil and bake until cheese is melted. I remember many, many years ago there was a small, somewhat dark and smokey intimate bar/restaurant that opened up “down in the flats” in Appleton WI. The name of the restaurant was called Jacqueline’s. They served the best sandwiches and my favorite was their French Dip. 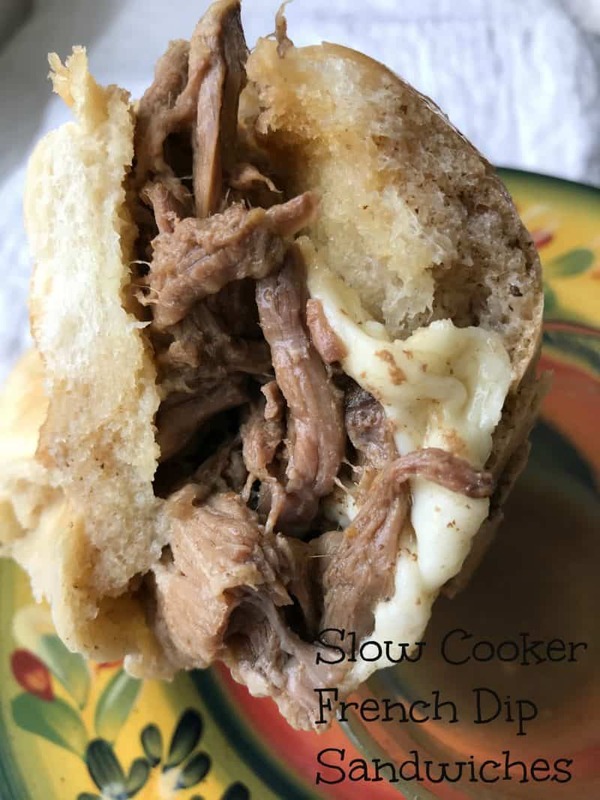 The beef was fork tender, the rolls slightly toasted and the sandwich was topped with melted and gooey provolone cheese, which was optional. The French Dip sandwich was served with a side of au jus, which was slightly thicken and super flavorful. For some reason, and I’m not sure why, the restaurant didn’t last long. It wasn’t because of the food, the food was delicious but it might have been ahead of it’s time. They opened in the late 70’s when fast food and subs shops were all the rage and intimate dinning was no longer in style. I haven’t had a French Dip sandwich that delicious since. 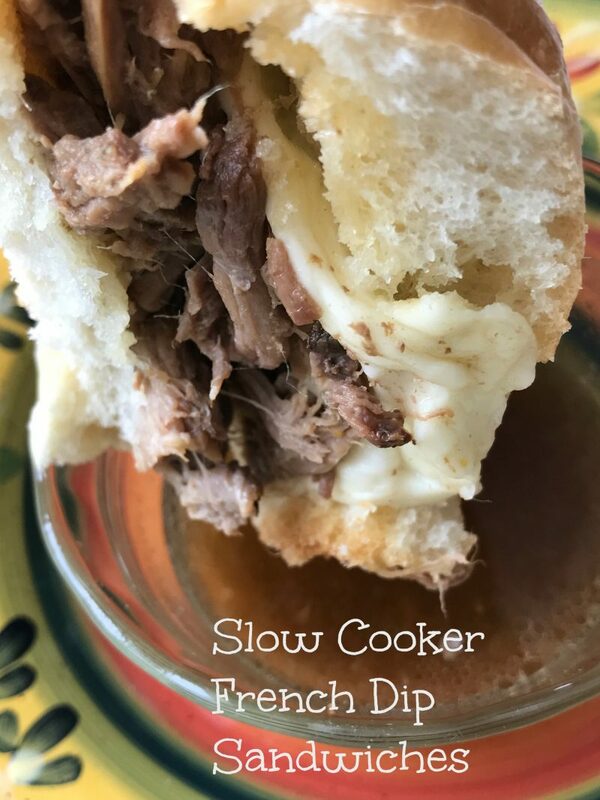 French Dip Sandwiches are truly meant, in my humble culinary opinion, to be enjoyed on a French baguette. Soft and tender on the inside and crunchy and chewy on the outside. A baguette is the perfect vehicle to soak up all of that delicious au jus. Here are two recommendations for purchasing a good baguette in my area, Le Petit Francais and Aldi. Looking for more delicious beef recipes? Then you might want to give these a try French Onion Soup and Hot Beef Pinwheels. 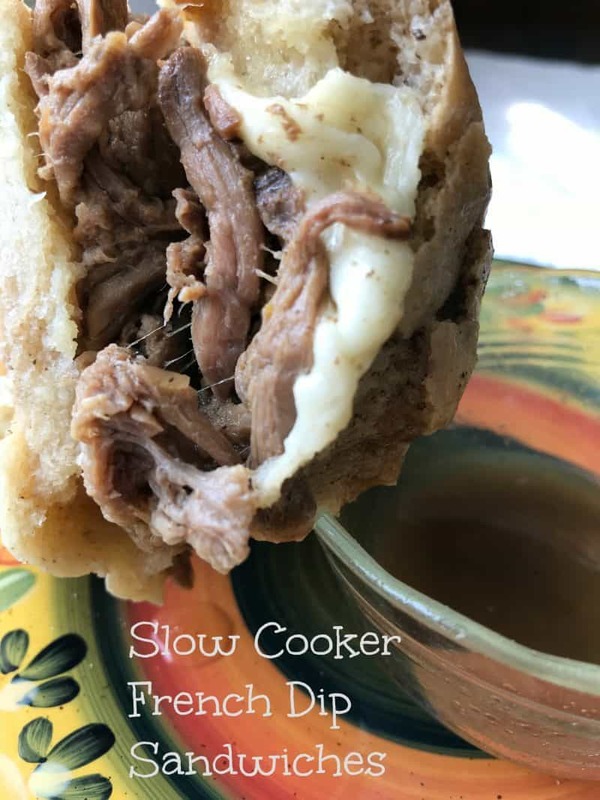 Slow Cooker Easy French Dip Sandwiches can also be served with Slow Cooker Caramelized Onions for that added something special. A delicious, hearty and easy recipe. Spray 3 to 4 quart slow cooker with cooking spray. Pour the soups and dry onion soup mix over beef. Cover; cook on low setting 8 to10 hours. Skim fat from liquid in cooker. Remove 3 cups of the juice from the slow cooker, pour into a small sauce pan. Turn heat to medium and bring to a boil. Reduce heat and let simmer until reduced by half, about 10 minutes. Transfer beef to a large plate and shred with a fork. To serve, cut each baguette in half horizontally, butter baguette and toast under broiler until lightly toasted. Fill baguettes with beef, top with slices of provolone cheese. Top sandwiches with French fried onions if using. Place sandwiches in a 13 x 9-inch baking dish, cover with foil and bake at 350 degrees for 5 to 10 minutes or until cheese is melted. Serve immediately with au jus on the side for dipping.